When it comes to looking at premium computers – premium style, premium specs, premium price – two models at the very top of the pile are the Surface Studio from Microsoft and the iMac Pro from Apple. But which of these elegant machines is best? That's not an easy question to answer, but we're going to give it a go. Here we're going to rank these two excellent all-in-one computers in the most important areas – design, specs, features and more. If you're thinking about making a purchase, it's essential reading. In all honesty, both the Surface Studio and the iMac Pro get top marks here: they're both superb machines to look at, and are sure to draw the eye of anyone who happens to wander into your study or bedroom or wherever it is you do your computing. The Microsoft Surface Studio is a touch smaller, when it's stood up, standing 43.9 cm (17.3 inches) tall and 63.7 cm (25.1 inches) wide. It boasts a 3:2 aspect ratio, 28-inch display with a whopping 4500 x 3000 pixels packed into it, for an overall pixels-per-inch rating of 192. The main guts of the computer are in the base unit, not behind the screen. The Apple iMac Pro, in comparison, is 51.6 cm (20.3 inches) tall and 65 cm (25.6 inches) wide. The 16:9 aspect ratio, 27-inch display has a resolution of 5120 x 2880 pixels – even sharper than the Microsoft offering at 218 ppi. The processor, hard drive, RAM and other components are all embedded in the rear of the screen. The Surface Pro's unique party trick is that it has a rotating hinge around the back, so it's easier to reposition than the iMac Pro (it can lay almost flat if you need it to). In terms of design polish, though, it's hard to split these two computers. Both the Surface Studio from Microsoft and the iMac Pro from Apple are available in a variety of configurations, but if raw power is really what you're after then the iMac Pro is the one to go for – in terms of processor it goes all the way up to an 18-core, 2.3GHz Intel Xeon W... wow (you'll have to pay for it, though, of course). In fact, the iMac Pro starts at an 8-core Intel Xeon W processor, the sort of chip that you normally see in a heavy duty workstations rather than a desktop computer. These CPUs get paired with 32GB, 64GB or 128GB of RAM, between 1TB and 4TB of SSD storage, and some lightning fast GPU chips from AMD. You get 8GB or 16GB of memory just on the graphics chip alone. The specs for the Surface Studio are far more humble, though still likely to be way above what anyone else on your street has. You can choose from quad-core Intel i5 or i7 processors, paired with 8GB, 16GB or 32GB of RAM, plus a 1TB or 2TB hard drive combining SSD technology with a more traditional hard drive. Some powerful graphics chipsets are available too, provided by Nvidia. Taking everything else out of the equation, the Apple machine offers better specs, but the iMac Pro is also likely to be overkill for all but the most demanding (and wealthy) users out there. Whichever option you go for though, these are computers that will easily cope with just about everything you throw at them. As we've already alluded to, these computers aren't cheap: both Microsoft and Apple are aiming at the premium, professional market with these models. It's the equivalent of shopping at the luxury end of the car market – you'll have to shell out a lot of cash, but you do get a lot in return. Starting with the Surface Studio, at the time of writing configuration prices start at £2,999/$2,999 and go all the way up to £4,249/$4,199 (for the top processor, storage, graphics and so on). In other words, you can buy three or four iPhone Xs for that. If you think those prices are eye-watering, you might want to look away now: table stakes for an iMac Pro, the cheapest configuration you can get direct from Apple, is £4,899/$4,999. If you really want to trick it out, you're looking at £12,279/$13,199 – and you can buy a pretty good car for that. Those kind of top-end prices only make sense for VR movie experts and professional film studios, but if you happen to have won the lottery this week, that's what you can get. Even at the entry level, you'll need to do a lot of saving. We've already mentioned the way you can fold the screen of the Microsoft Surface Studio down flat, and it also has another advantage over the Apple iMac Pro: it's a touchscreen, so you can doodle on it with the Surface Pen (included), and change various options and settings with the Surface Dial puck (not included). In terms of ports and connectors, the Surface Studio brings with it four USB 3.0 ports, a full-size SD card reader slot, a Mini DisplayPort connector (for another display) and a 3.5 mm headphone jack. Two built-in speakers provide stereo sound, while there's also a 5-megapixel, 1080p HD video front-facing camera for your video calling needs. As for the iMac Pro, it offers four USB 3.0 ports, four Thunderbolt 3 (or USB-C) ports, a full-size SD card slot, and a 3.5 mm headphone jack (you can use one of those USB-C ports to power another display, if you need to). On the front there's a 1080p FaceTime HD camera to make video calls from your desk, and stereo speakers are fitted. One of the biggest differences between these two computers is that one runs Windows and one runs macOS. We don't have space to go into a full comparison here, but check out our previous article on the topic – in the end it depends on which operating system you're most comfortable using, and which one offers the apps that you need. 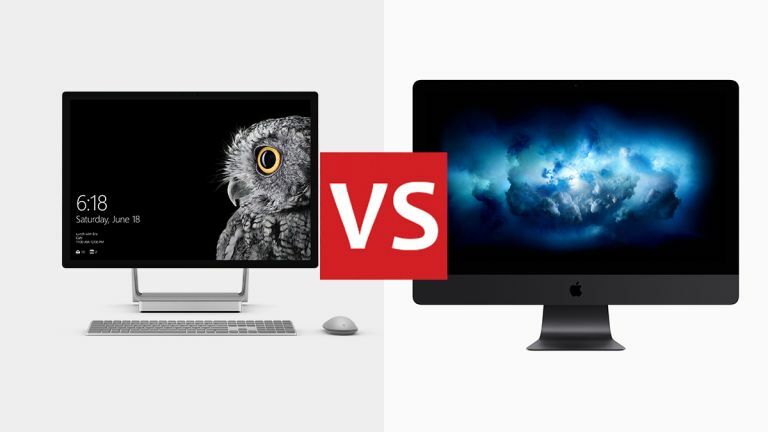 Both the Surface Studio from Microsoft and the iMac Pro from Apple are very expensive, very powerful computers – only consider these if you've got a lot of money to spend and some very demanding tasks (like 4K video editing) to get through. Otherwise, you're better off going for one of the many cheaper Windows or macOS machines out there. Speaking of operating systems, if you've got a solid preference for one or the other, then that's likely to sway you far more than the specs or the design of these machines. The Surface Studio is the premium all-in-one to get for Windows fans, while the iMac Pro is the premium all-in-one to get for macOS fans. Considering that Apple also makes the iMac, there is a ready-made cheaper option for those who prefer macOS. For those who'd rather use Windows, you need to shop around for a cheaper all-in-one from Dell, Acer or another of Microsoft's partners. That's something to factor in when you're weighing up whether or not to make a purchase. The bottom line is that these two fantastic all-in-ones are very hard to separate. Microsoft's Surface Studio is more affordable and flexible, with the hinge and touchscreen to consider, but Apple's iMac Pro blows everything else out of the water in terms of the power and performance it can offer.